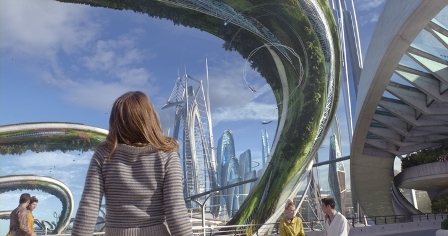 Tomorrowland is one of those movies that’s fun while you’re watching it, but starts to fall apart if you give it any thought afterward. The film’s strengths rest in a couple of good performances and some interesting ideas. For a film that’s supposed to be about imagination, it falls disappointingly short in that department. 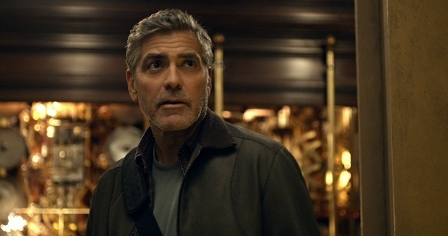 Tomorrowland flounders in its storytelling and fails to stay consistent with its concepts. That being said, it’s fairly entertaining and is a fun family film. What’s missing is Tomorrowland itself. We only get glimpses of this futuristic world where all the brightest minds have gathered to solve the problems humanity faces. Instead of spending any quality time there, the film sets up a fairly rudimentary plot where the very future is at stake unless an unwitting hero can prevent disaster. We’ve seen it many times before and this film doesn’t do anything to add sparkle to the well-used trope. In this case the unwitting hero is Casey Newton (Britt Robertson), a teenage girl who can’t stand that her NASA engineer father (Tim McGraw) is losing his job. Every night she heads out to the rocket launch platform at Cape Canaveral to sabotage the cranes that will tear it down. Casey also can’t stand that no one seems to be doing anything about all the atrocities of the world. Her teachers lecture about them in school, but when she asks what can be done, they give her a blank stare. I do love that this film worked the elimination of NASA jobs into this film. 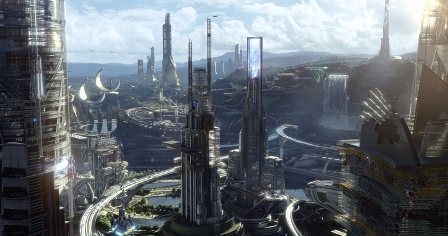 I wish they had spent more time with the implications of that and how it would ultimately affect the future of Tomorrowland. Instead we are pretty well grounded in present day reality. 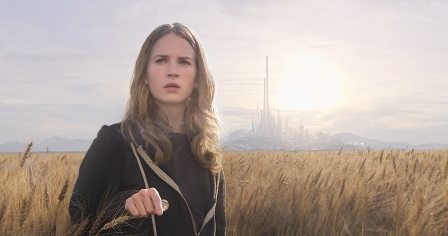 Casey receives a mysterious pin that gives her a glimpse of Tomorrowland every time she touches it. Through an internet search she learns that the pin was manufactured for the 1964 World’s Fair. We already know all about the pin and the fair because we were introduced to it in the first act of the film where we met a young boy named Frank Walker (Thomas Robinson). Young Frank also has high hopes for the future and he also receives the mysterious pin and discovers its supernatural powers. What goes unexplained is why Frank’s pin works different than everyone else’s. Unfortunately the film is full of these kinds of inconsistencies. I wish we had spent more time with Frank as a kid. He’s the one with the inside look at Tomorrowland because he apparently lived there for many years. But we leave him shortly after he gets there to head to present day where we meet Casey. 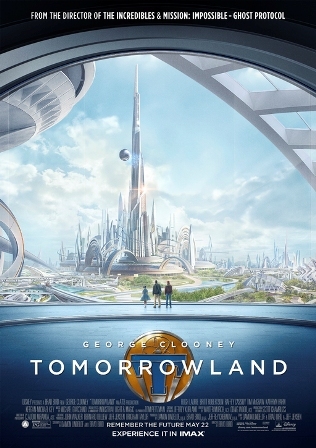 Casey spends most of her time searching for the adult Frank (George Clooney) and trying to figure out how to get to Tomorrowland after meeting Athena (Raffey Cassidy), the girl who doles out the mysterious pins. By the time it all comes together the film is almost over. What we do get to see of Tomorrowland is pretty cool. It’s a world with limitless possibilities that’s meant to inspire hope for the future. It totally would if we got to see its full potential. 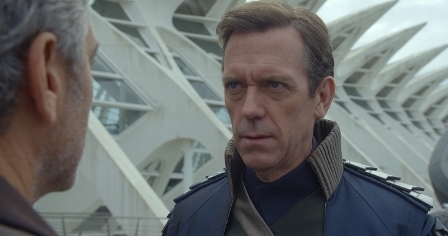 Instead the film is bogged down with a conventional corrupt bad guy, Governor Nix (Hugh Laurie), trying to ruin everything for no real reason. If this film had solidified its plotline and done something truly creative with its concept it could have achieved the greatness its attempting to inspire.